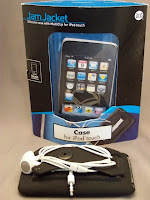 Since buying my Ipod Touch, I have been looking for a decent case for it, and a better way to store the headphones. As a temporary solution I had the 3 pack of silicone covers from Walmart, but they didn't stay on all that well. I kept the earbuds in a tiny plastic box in my pocket, separate from the iPod. I wanted a belt clip, and some way of storing the earbuds would be nice. A friend had a case for his Nano that had headphone storage, and I really wanted one like that. I had pretty much given up, when I found the Jam Jacket while shopping for something else. The clip on the back does triple duty as cord storage, a belt clip, and a stand. The clip is rubber coated metal X, and has a three dimensional curve to it. The clip will sort of pop and turn inside out to make the legs stick out to use as a stand, and to make winding the cord easier. I'd rather the stand function were a bit less upright. The clip also twists, but I have not found an advantage to that yet. The case adds considerably to the thickness of the iPod, especially in the center. The rubber is much thicker and sturdier than the silicone covers I had. The case also comes with a pre-cut screen protector. As a belt clip, the iPod has to be vertical, and if you are shaped like I am needs to be on the rear half of your body if you plan to sit. (Someone with a smaller belly may not have this problem). Cord storage works best if you arrange the earbuds at the top of the clip, and then wrap the first half of the cord in a figure 8 around one pair of legs, the other half around the other 2 legs. Tuck the jack in. This minimizes bulk by keeping the winding of the cord away from the thickest part (in the same way that holsters with their loops or clips beside the gun rather than on top do). The clip can keep the cord stowed reasonably well when using it as a stand, but not so much if being used as a belt clip.